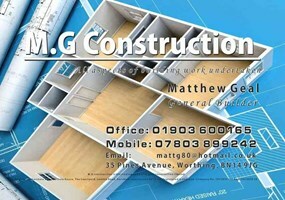 M G Construction - Builder, Driveways/Patios/Paths based in Worthing, West Sussex. M.G Construction is a reliable, friendly building company who undertake all aspects of building work. With 20 years experience no job is too big or small. Our aim is to guide you through all aspects of your project from planning to completion. From minor repair works to loft conversions, extensions, driveways, landscaping and total refurbishment works including kitchen and bathrooms we have the skill, experience and trades to provide you with a high standard of workmanship.